There are more than 200 clematis species and most are deciduous vines. They are a popular garden plant because of their unique flower shape and the multitude of colors of their blooms. They blossom in pink, red, blue, lavender, purple, white and cream. A number of factors determine whether deer will eat clematis. According to West Virginia University research, whether deer will target clematis will depend on their habits and food needs. The deer population, whether it is high or low, as well as the availability of other foods, will also determine whether they will eat clematis. 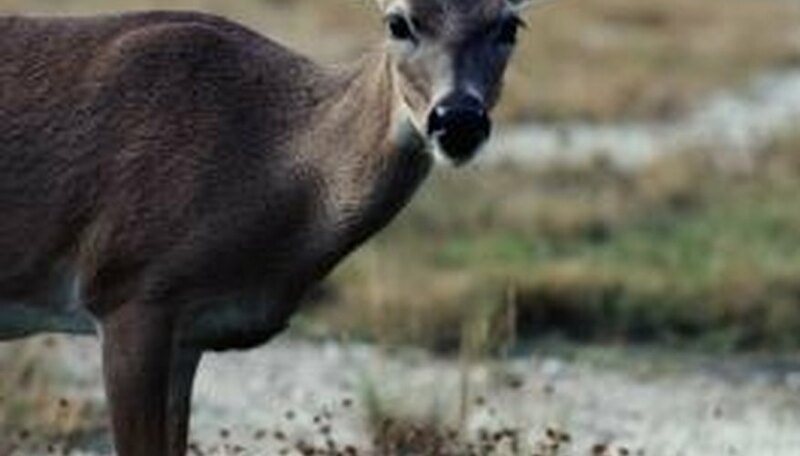 Rutgers University has rated plants by their resistance to deer. Plants with an "A" grade are most deer-resistant. 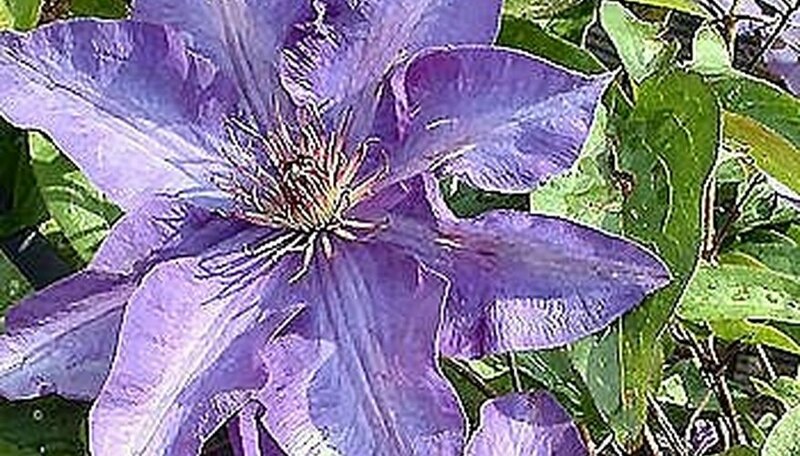 Clematis gets a "C" grade, meaning the plant is occasionally severely damaged by deer. If you want to plant clematis in the garden and have deer leave it alone, plan to use some kind of barrier. You can erect a temporary fence or use deer repellent. Another choice is to plant the clematis close to the house; deer will usually stay away from humans and their habitat. In the spring or early summer, dig a hole one foot deep and one foot wide. Mix the soil from the hole with compost, working it until it maintains a loose rich texture. Ideally this should leave you with a very dark soil. Create a mound in the bottom of the hole using the enriched soil. Place the plant above the mound and allow the roots to trail over the mound. Cover the roots and fill in the hole with the enriched soil, keeping the crown of the plant about 2 inches below the soil level. This plant likes shade on the bottom and sun on the top. Water at planting and regularly for the first season,( I prefer to water in the morning or evening and do so every other day.) after that you should only need to water in extreme dryness and drought. Install a piece of trellis or fencing behind the Clematis to give it support as it grows and a foothold for climbing. To promote blooming and keep your Clematis healthy, prune as needed after the blooming season, and in preparation for the blooming season prune in late March each year. Prune lightly in early spring by cutting out weak growth, but save as much old growth as possible. For a spectacular summer display, cut the entire plant back to 2-4 feet in the spring. You will sacrifice your spring blooms by using this method, but you'll get a striking summer show. Tip Here's an idea for those summer shrubs such as forsythia that are spectacular in spring but a bit boring the rest of the year: Plant clematis vines under the shrub. The clematis will add a bright burst of bright summer color to your otherwise dull spring shrub, and the clematis will thrive with a little shade on the roots during the heat of summer. Choose a sunny location with a trellis or fence to support the clematis. Clematis generally does best when the roots are sheltered from the sun. If possible, position the clematis near low-growing shrubbery so that the roots will be shaded. Sprinkle 1 cup of lime on the soil in the planting location and work the lime into the soil with the garden spade. If the soil is especially heavy, add compost to make it drain more efficiently. Dig a hole that is 2 feet deep and 2 feet wide. Remove the clematis from its temporary pot and place it in the hole so that the crown of the plant will be approximately 3 inches below soil level. Refill the hole with soil around the plant and pat it firmly. Water the newly planted clematis well. Add approximately 3 inches of mulch around the base of the plant. 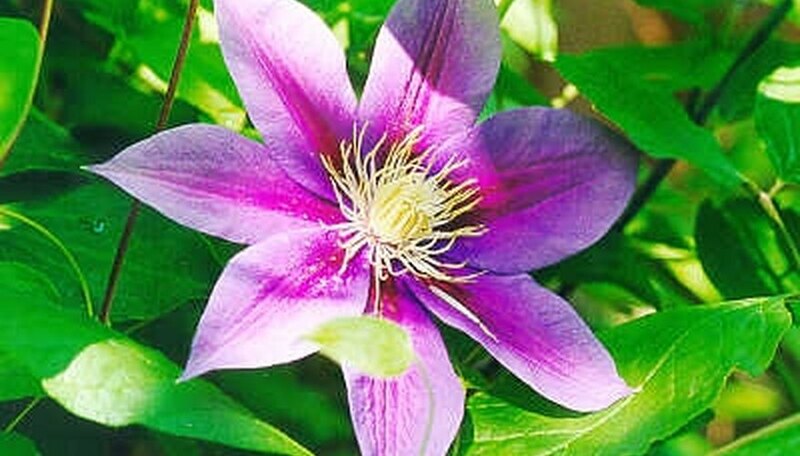 Fertilize the clematis with a tomato or rose fertilizer after the plant is established and is growing well. Prune the clematis annually. Prune summer blooming clematis in the spring to remove old growth before it blooms. Prune spring blooming clematis lightly after the plant finishes blooming to remove the old growth. Postpone harvesting clematis seeds until the seed pods begin to turn brown. This usually takes place a few days after the first frost. Locate the seed pod, positioned directly in the center of the fading bloom. It will appear to have broken open into thin vertical splits. Look for flossy or shiny hairs that protrude through the pod opening. Each of these shiny hairs has a clematis seed attached to its end. Inspect the seeds. Use tweezers to pluck a few hairy strands from the pod, and check the color of the attached seeds. Harvest the seeds from the plant when they turn brown in color. Hold your container under the pod, and lightly grasp the seed pod between your thumb and index finger. Pull the pod head toward you using a slight twisting motion, and let the seeds fall into your container. Secure the lid to the container. Store the seed container in a cool, dry place. Soil: Clematis need to be planted in rich, loose, and fast-draining soil. Also, be sure to add generous amounts of organic material to soil. Planting: Dig a hole big enough to cover the root ball and about two inches of the base of clematis stem. Apply complete liquid fertilizer once a month throughout the growing season. Roots: The roots of the clematis need to be kept cool by adding mulch, placing a large rock over the soil, or by planting shallow-rooted ground cover with clematis. Sun: Clematis need partial to full sun. Watering: Soil moisture should be constant for clematis. Pruning: Stems should be pruned to one foot tall every spring as soon as buds start to swell. Pinch or lightly shape blossoming portions to stimulate low branching. Secure new stems to a trellis, wire, or other support with twist ties. 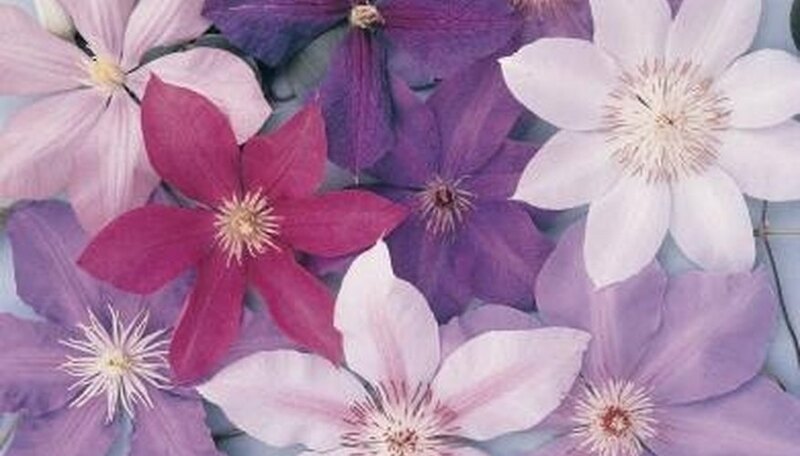 Cut Flowers: Cut clematis flowers can be floated in a bowl. Burn cut stems with a match to prolong flower life.